Your dentist has been pushing that slogan for decades, as a reminder to take care of your teeth. As a diabetic, the same saying goes for your feet! 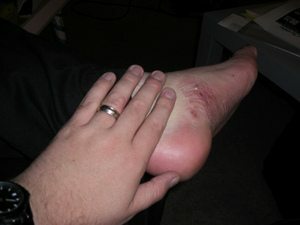 Fail to take your blood sugar levels seriously and sooner (rather than later) you’re going to have foot problems that could easily lead to amputation. Diabetic foot neuropathy occurs when you are diabetic and you ignore your high blood sugar levels, resulting in blood vessel and nerve damage within your body. First, you may develop burning pain or numbness in your feet from inadequate blood flow. Soon, a simple cut or blister could become infected because you didn’t even know you had a slight injury. Next, that minor injury snowballs, and before you know it your life is reduced to a wheelchair because you’ve lost your foot! From that point, lack of exercise makes matters worse and your general health quickly declines. You know where this is headed, don’t you? Yes, failure to maintain a safe blood sugar level can become life-threatening surprisingly fast. The reason? Those are the parts of your body with the smallest blood vessels. #1 – Wash and dry your feet daily. Use warm water and mild soaps. Rinse well and pat dry (rather than rubbing your feet dry with a towel). Remember, the point is to not irritate the skin. Apply lotion to retain moisture in your feet, but don’t use lotion between the toes! The area between your toes needs to dry completely, since moisture allows bacteria to grow which can lead to Athletes Foot infections. #2 – Inspect your feet daily. Examine your feet looking for sores, cuts, abrasions. Also look for swelling, blisters, or cracks between the toes. Inspect the soles of your feet too. One of the signs of diabetes is loss of feeling in the feet. This means you could step on a sharp object that penetrates your foot and not even know it! If getting up close and personal with your feet is physically impossible, then have your spouse (or even a neighbor) check them for you as often as possible. #3 – Trim your toenails & care for foot sores properly. Keeping your toenails trimmed neatly and straight across will help avoid ingrown toenails or cuts from one toe rubbing against another. Never use commercially available corn preparations. They can damage skin, and any open sore is likely to become infected and spread. When you have diabetes, foot ulcers can be very slow or impossible to heal. #4 – Wear shoes that fit properly. Avoid the bare foot or flip flop look. When you are susceptible to diabetes, you need to look at footwear as a protective shield against injury. Your feet need to be comfortable with adequate room for your toes. Poor-fitting footwear can cause blisters and abrasions quickly — which won’t heal properly if you’re diabetic. #5 – See your doctor regularly. Stay current with your Hemoglobin A1c test (also known as HA1C blood tests). Follow your doctor’s instructions concerning the frequency of blood test strip checks. Monitor your blood sugar religiously. The better you control your blood sugar levels now, the better your odds of avoiding traumatic foot problems later on. When I was first diagnosed with Type II Diabetes about 7 years ago, keeping my blood sugar in check was a simple matter of taking one pill a day. I was still able to eat whatever I wanted. But over time, diabetes changes within your system. Now, my prescription has increased to double that amount, and I take it twice a day. Plus, I have to take a second medication to control my diabetes as well. The point is don’t assume things are and will continue to be just fine. Keeping diabetes under control will be an ongoing challenge for the rest of your life. Maintaining mobility is much easier with 2 good feet. It’s in your best interest to take care of them… daily!